Beyond the Hotspot software that comprises the bulk of their business, Connectify Inc. makes another utility for laptop enthusiasts: Dispatch. 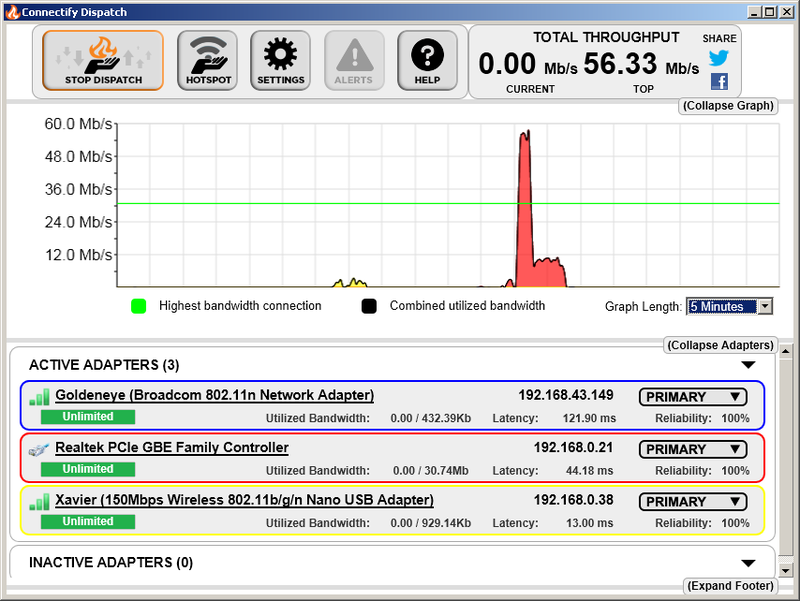 The adapters list appears at the bottom of the main interface window, and a handy graph provides throughput information over time. Connectify Dispatch works by simultaneously leveraging the multiple network adapters and high-speed USB ports available on modern systems to boost bandwidth and reliability. 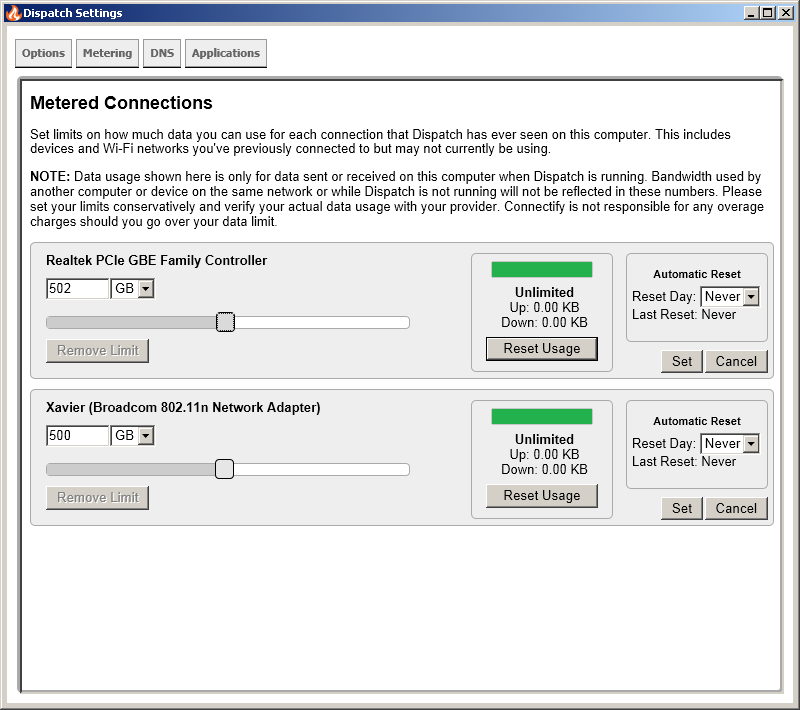 Each Internet connection you add to Dispatch's list of active adapters increases potential download speeds and provides automatic failover in the case one of the connections fails. For the most part, this works swimmingly. However, there's a bit of the devil in the details. Setup is straightforward and largely automatic. 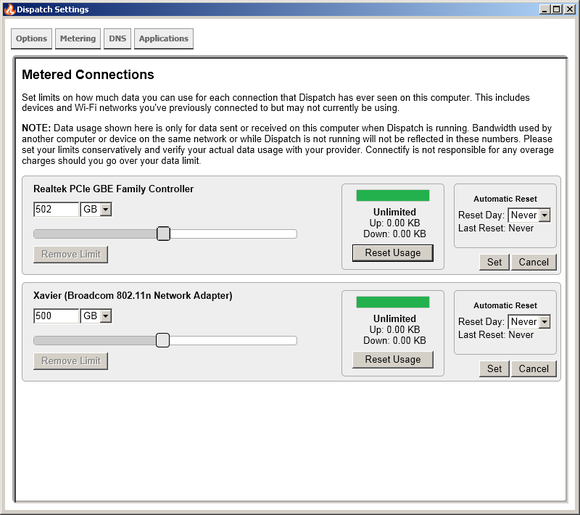 Users are presented with a window that lists available adapters and indicates whether or not they are bound to Dispatch. 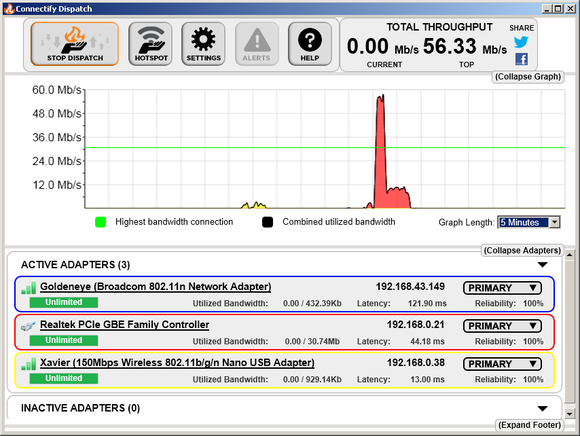 A graph charts the combined bandwidth on tap, and settings allow for customized application routing, bandwidth caps for metered Internet feeds, and various routing strategies that maximize efficiency in marginal networking situations. The first prerequisite is an obvious one: You need access to multiple, separate Internet connections for Dispatch to work as advertised. The hidden detail here is that combined bandwidth isn't directly additive. Two 20 Mbs connections won't yield a 40 Mbs single-socket download, for example, but they will allow for loads to be balanced and intelligently routed to an available adapter with the most suitable bandwidth. BitTorrents and other software that utilize multiple sockets will allow downloads to reach full combined speeds, however. Different routing strategies let you maximize performance for asymmetrical Internet connections or emphasize reliability over speed. Next, your system will need the hardware to make practical use of those multiple internet connections. 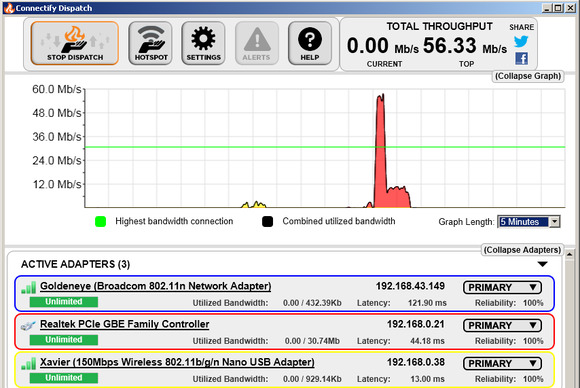 While most laptops have more than a single network interface, normally only one is wireless. This means getting the benefits of Dispatch requires either cabling up with Ethernet or adding a USB Wi-Fi dongle to your system, complicating matters somewhat, especially on the road. How often do you find Ethernet jacks outside of office environments, where connectivity is rarely an issue? With a small investment of setup time and money, however, Dispatch's usefulness grows considerably. Adding one or more tiny plug-and-play Wi-Fi adapters (such as EdiMax's Nano 802.11) to unused USB ports dramatically multiplies the performance benefits of Dispatch, especially in bandwidth-starved but Wi-Fi-rich environments such as coffee shops, libraries, and trade shows. Just make sure to have all the login credentials saved before you settle down with your latte. In fact, it's under these conditions that Dispatch really shows its potential. At home and hooked up to a stable high-speed network, the benefits are largely negligible unless your own Internet service is crummy enough that you're poaching a neighbor's Wi-Fi. But out on the road, a combination of local establishment Wi-Fi, a nearby hotspot, and a tethered 4G smartphone can yield an office-level networking experience in terms of speed and reliability. Metered usage controls can close the money spigot when downloaded bytes start turning into overage charges. It's a shame that Dispatch comes in at a sizable $45 for a lifetime license or $12 a quarter for subscription-based licensing, each of which is twice the price it should be. No free versions exist. The extra hardware and effort required to make the most of Dispatch means the investment doesn't stop with Connectify's charges, either. Nevertheless, people who spend most of their laptop time in the field will want to take Dispatch for a spin and give it careful consideration. Road warriors will love Dispatch, but desk jockeys shouldn't bother.